Regardless of how you identify yourself or who you love, the adoption process can prove to be a beautiful thing that can bring new meaning into your life while allowing your new child to thrive in a supportive environment. Today’s strife centers around a lot of topics, from birth control to burial ceremonies and everything in between. 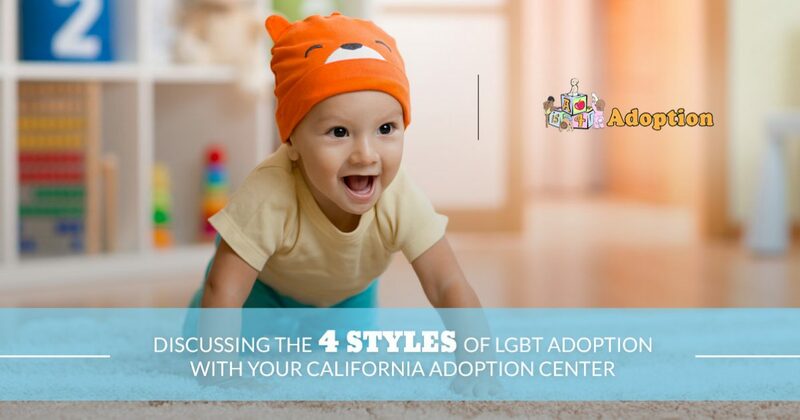 If you are a part of the LGBTQ community, you may be worried about finding an adoption agency in California that can provide the best support for your unique goals and needs. A is 4 Adoption is here to help, reducing the stress and anxiety of adopting a child while providing the best adoptive parent and birth mother help in the industry. Our team works hard to deliver more children in need into the arms of more loving parents, creating an optimal outcome for everyone involved. We’re dedicated to supporting LGBTQ families across our country with experience and guidance to ensure that every home is full of love and support. Our adoption experts are ready to help you in any way that we can, from financial support for pregnant mothers to educational blogs to help those who want to learn how to adopt a child. LGBTQ individuals have a range of adoption approaches to take, and today, we’ll highlight each style of LGBTQ adoption. When finished, be sure to reach out to our adoption center to learn about our services! If you identify as LGBTQ, you do not necessarily need to have a significant other to adopt. Many single individuals have found success with private adoption steps, relying on a representative to work through the rules and regulations to ensure a smooth and compliant adoption process. On your own, you will face unique challenges in terms of child care and support. Single parent adoption is the least common style to use amongst LGBTQ individuals. In situations where one parent has parental rights over the child in question, they can give legal authority to their spouse. As the parent, you have the ability to bestow equal rights on your partner through the adoption process. This powerful approach is also not very common but can provide major benefits for your family. Determining the best approach for adopting a baby can be a challenge, which is where our experts can help! This approach is very similar to second-parent adoption, except you and your significant other need to be legally married first. After getting married, the parent of the child can give full legal rights to their significant other through the adoption process. Joint adoption is normally the most common approach for LGBTQ couples across the country. In this style, you and your spouse will be adopting a child together, sharing the same rights and responsibilities since day one. While equality is a top focus with LGBTQ adoption, many states hold their own unique regulations concerning adoption laws. Some states mandated that you need to be married first to file for adoption, which, after the Supreme Court’s 2015 ruling, is no longer the biggest obstacle. Remember, though, that legally married LGBT individuals may still not be able to adopt in states such as Texas. As your guide for domestic adoption, our experts can help you determine the best route for your adoption plans. If you identify as LGBTQ and you want to adopt a child, it can be difficult to navigate the legalities of this highly contested industry. A is 4 Adoption is proud to help you through this process. Unlike normal adoption agencies in California, our adoption center is here to provide personalized solutions to create the best outcome for your growing family. Contact us today to learn more about our comprehensive approach to adoption!